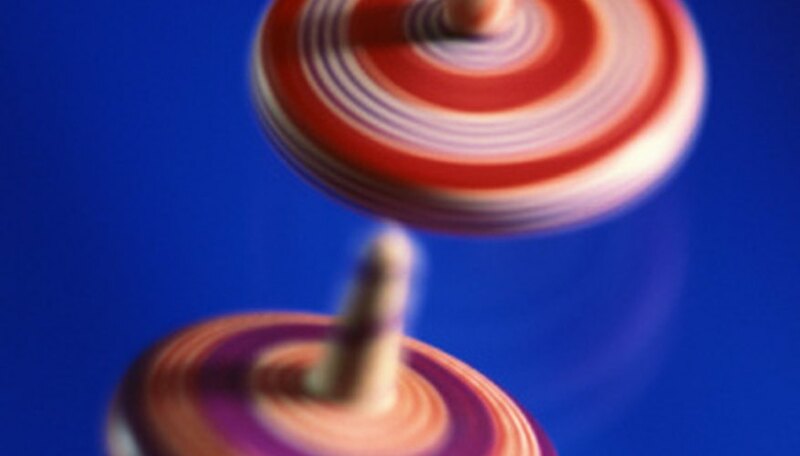 Simple, yet challenging, spinning tops have a history dating back 4,000 years, to ancient Egypt. Teachers, students and scientists marvel at this small toy's demonstration of complex theories and abstract concepts in engineering, physics, earth science and even biology. Momentum, inertia, mass, gyroscopic precession, friction and energy become clear by experimenting with a spinning top. A comprehensive science project includes a research question, hypothesis, procedure, results and conclusion. To get started, you need to ask a few questions, such as "How does this work?" and "What will happen if I change one thing and keep the other conditions the same?" You then predict the effects of the changes, looking at conditions and thinking like a scientist. After experimenting to see different outcomes, you observe and record your results. An easy science project about additive primary colors attaches a pie chart -- with at least three equal-size triangles in green, red and blue -- to the top's surface. (This is different than the primary colors for pigments, which are red, yellow and blue.) When the top spins at its fastest speed, you see a glare of white instead of separate colors. For a science project, you can use the colors of the rainbow, and demonstrate how colors mix together and the reflection of light that comes from them. Also, trying more color patterns, black and white swirls, and different patterns can answer the question, "Does this change the effect on the human eye?" If you manipulate the mass of a spinning top, you will achieve different outcomes for the momentum and longevity of the top’s spin. A science project could add more weight to the bottom of the top or near the perimeter, using materials such as modeling clay or washers. Your project would answer the question, "How does this affect the spin, and why?" If you put the same amount of weight on the spinning top, but move it progressively away from the perimeter, you will note less rotational inertia near the center, because the rotational inertia depends not only on the mass of the spinning top but also on the location of the mass. You could also explore kinetic and potential energy related to the friction that causes the top to slow and eventually stop. As part of the Upward Bound Math and Science program in August 2010, high school students in Georgetown, Delaware, used the engineering technologies department at Delaware Technical & Community College to build the most efficient spinning top. As a three-part project, you can elaborate on the applied physics concepts of weight, center of gravity and rotational inertia. To build a spinning top, you'll experiment with several materials -- such as aluminum, cardboard, clay, foam, wood or even a compact disc -- and compare the effect on the top's spin. The Upward Bound students used a computer-aided design, or CAD, program to make a 3-D model of their top. Brandy Pohl has been writing since 2004, when she was published in "Destination Purdue," an agricultural magazine for Purdue University. She has worked in marketing, inside sales, pharmaceutical contracts and the education industry. Pohl holds a Bachelor of Arts in communication from Purdue University and is pursuing her teaching licensure in elementary education. Pohl, Brandy. "Spinning Tops for Science Projects." Sciencing, https://sciencing.com/spinning-tops-science-projects-8050196.html. 25 April 2017.